What fruits do you buy / eat often ? – earlier it was bananas, oranges, mangoes, sapota, grapes, guava, water melon, papaya ~ from Super markets, we started buying – berries, plums, litchis, - kiwi, butter fruit, passion fruit, dragon fruit – sometimes without even knowing what they are or how they would taste. This post is on a new variety of fruit [new to me !] 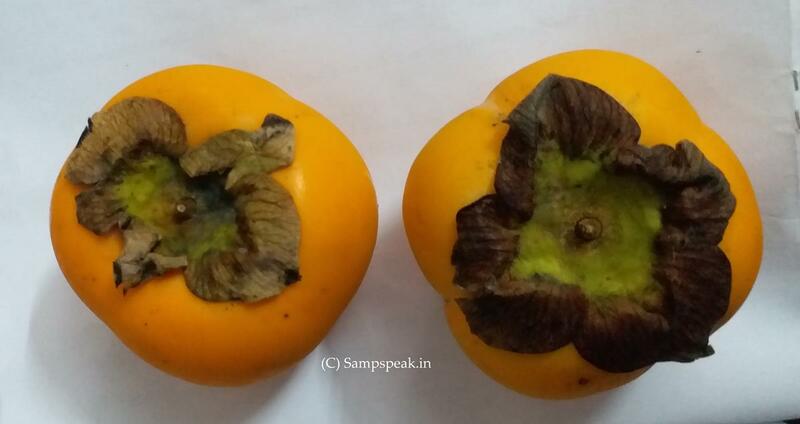 - yellowy-orange, tomato-shaped, orange sized – so called exotic fruit .. .. . ‘persimmon’ by name. I could remember West Indies Opener Phil Simmons. Philip Verant Simmons debuted in 1987 World Cup – remember him scoring freely against Pakis, making a 50 in his debut. Touted to be an attacking batsman who can bowl medium pace, his career did not prosper greatly and he retired in 2002, embarking on a coaching career. Took the role in Zimbabwe, faced difficult times inheriting a weak side due to mass dismissal of seniors. Under him Zimbabwe failed and he was sacked in 2005. He went on to coach Ireland and significantly improved them. 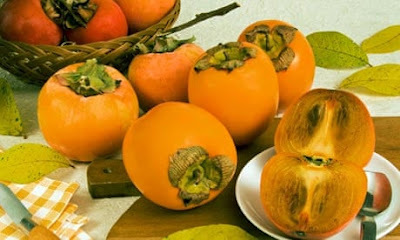 The fruit ‘persimmon’ also known as Sharon fruit is said to be high in beta carotine and minerals such as sodium, magnesium, calcium and iron, and studies have found that they also contain twice as much dietary fibre per 100g as apples, plus more of the phenolic compounds thought to ward off heart disease. The first piece tasted delicious – it was in fact sweet, and immediately I googled ‘whether persimmons good for diabetes ?’ – the first result showed that : Persimmons may also be a great treat for diabetics! Persimmons contain bioactive molecules like proanthocyanidin, carotenoids, tannins, ﬂavonoids, anthocyanidin, catechin, etc. that fight against diabetes, oxidative stress and cardiovascular illnesses. Because persimmons are hefty in fiber, they may help curb your hunger levels, which is known to be a big problem for diabetics. Persimmons can also help regulate blood sugar levels. Further searches revealed that this fruit is produced mainly, these days, in China, Korea and Japan, with varieties also found in America, southern Europe and even Britain. It is stated that while non-astringent varieties can be eaten, firm and crisp, while barely ripe, the astringent kind – rich, sweet, spicy – are mouth-puckeringly tart until fully ripe. Fortunately, it's not hard to tell when a persimmon is ripe.. .. .. and that the ripening can be hastened by leaving persimmons in a paper bag along with an apple, which produces extra ethylene to soften the fruit. Originally from China, persimmon trees have been grown for thousands of years for their delicious fruit and beautiful wood.Their orange-colored fruits called persimmons are known for their sweet, honey-like flavor.While hundreds of types exist, the Hachiya and Fuyu varieties are among the most popular.The heart-shaped Hachiya persimmons are astringent, meaning they are very high in plant chemicals called tannins that give the unripe fruit a dry, bitter taste.This type of persimmon needs to be fully ripe before eating. Persimmons can be eaten fresh, dried or cooked and are commonly used around the world in jellies, drinks, pies, curries and puddings. They are tasty and are packed with nutrients - a good source of thiamin (B1), riboflavin (B2), folate, magnesium and phosphorus.These colorful fruits are low in calories and loaded with fiber, making them a weight loss-friendly food.The leaves of the persimmon fruit are also high in vitamin C, tannins and fiber, as well as a common ingredient in therapeutic teas. A word of caution – not all information available on web is true or authentic. The fruit is as tasty or more than an apple and I am afraid of its sugar content or what it can do to my sugar levels. In general, diabetics are advised to avoid fruits in full or cut – ‘banana, mango, jack fruit’ are taboo as they can enhance the sugar levels considerably. 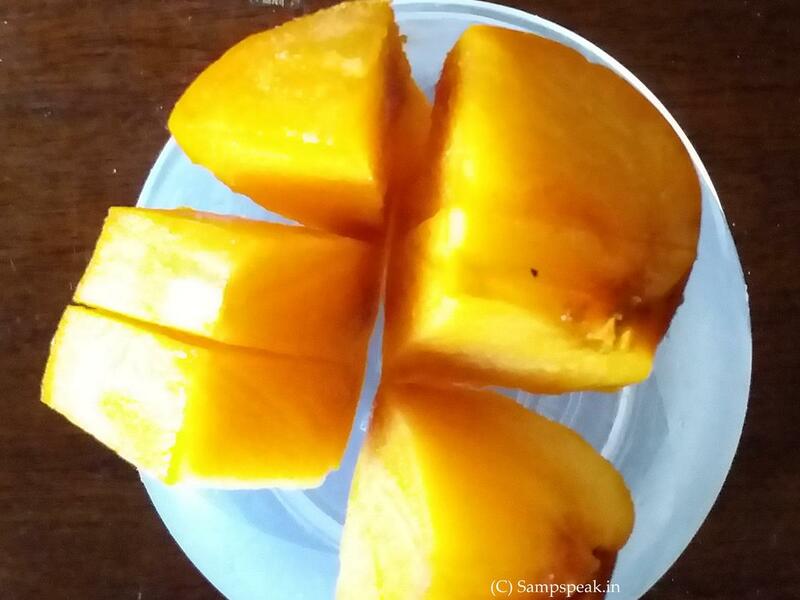 I am unable to comprehend that ‘jack fruit’ is good for diabetics and in same vein cast doubts on the health benefit of persimmon to diabetics. Individual metabolism can be different .. ..